Do These Charts Look Like "Recovery"? It's one or the other, Ben: you either push the real economy over the edge or you push stocks and the risk trade off the cliff. Now that you've pushed the dollar down, Ben, it's your pick on what to push off the cliff: your beloved risk trade or the real economy. 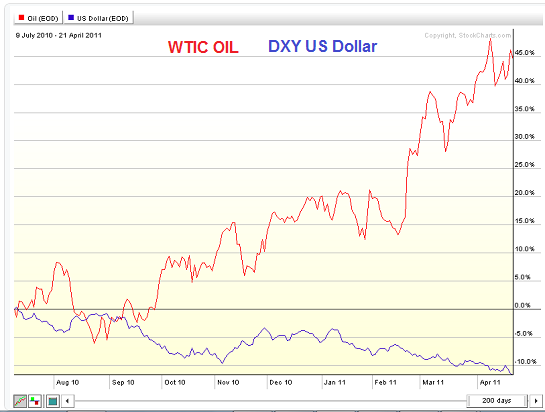 Here's a chart of the U.S. dollar and crude oil. Notice they're on a see-saw: when the dollar tanks, oil skyrockets. When the dollar recovers a bit, oil declines. Ben Bernanke and the Fed are replaying their 2008 game plan: drive the dollar down to goose the risk trade in stocks. But a funny thing happened on the way to blowing another equity bubble: oil bubbled up, too, and that killed the real economy. For the past three years, Ben has been trying to resuscitate the real economy via "the wealth effect": if your portfolio of stocks is rising, then you'll feel richer and your "animal spirits" of borrowing and spending will be aroused. The only proven way to goose stocks is to crush the dollar so overseas corporate earnings will be boosted by the currency depreciation (when transferred back into dollars, even flat profits look like they're rising), and U.S. exports will be cheaper to our trading partners. Flooding the U.S. market with liquidity and keeping interest rates at zero had another consequence, one adamantly denied by the Ministry of Truth: it sparked a carry trade in which cheap dollars could be borrowed for next to nothing and exported around the world to seek higher returns. Unsurprisingly, much of this free money flowed into commodities, which retained their value as the Fed pushed the dollar down. Also unsurprisingly, oil exporters raised the price of their oil in dollars as the dollar tanked. Ben and his motley crew at the Fed reckoned that the financialized U.S. economy would respond positively to the lower dollar and the goosing of the risk trade in stocks. But the guys and gals seem to have forgotten that the real economy is dependent on oil. All the folks at the cocktail parties attended by Yellen et al. may be gushing over their hefty stock gains, but in the kitchen and carpark the workers are grousing about the rising prices of food and gasoline. Now the cost of oil--the lifeblood of the real economy--is close to the point that it will push the real economy into recession. This sets up a difficult choice for Ben: if he pushes the dollar down to new lows, then oil leaps up and pushes the real economy off the cliff. Alternatively, Ben renounces QE3 and "surprises" the markets with a rate increase, thus rescuing the dollar from freefall and pushing oil down. But that will send his precious risk trade and equity Bull off the cliff. The politicos won't like either choice, but sacrificing the real economy will cost them their seat. All the fatcats who've raked in tens of billions from the risk trade Bull will be demanding that Ben "save" the financialized economy, but the politicos will see their political obituaries being written. Yes, the fatcats will shower them with millions in campaign contributions, but even those millions won't change the fact that Americans reliably vote their pocketbooks. If rising oil pushes the real economy over the cliff, voters will not be re-electing incumbents in 2012. Welcome to reality, Ben. Your "let's pretend the recovery is real" game is nearing an end. If you push the dollar down any more, then oil will go up and tip the real economy into a recession that QE3 will only make worse as you send the dollar into freefall. If the dollar rises, then your beloved "wealth effect" dies a horrible death on the rocks below. Take your pick, but choose wisely. Thank you, Christine P. ($50), for your stupendously generous contribution to this site-- I am greatly honored by your support and readership. Thank you, Rick E. ($5/mo), for your splendidly generous subscription to this site-- I am greatly honored by your support and readership.